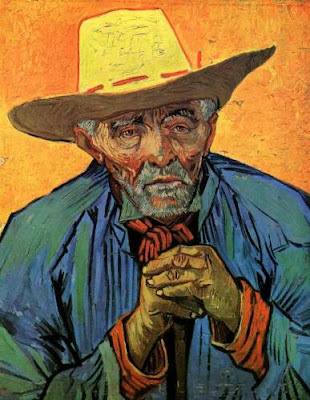 "This oil painting is "Portrait of Patience Escalier" by Vincent Van Gogh. It was produced in August 1888 when Van Gogh was a resident in Provence, France. Provence is in south of France, where the weather is intensely sunny. He was extremely inspired by the atmosphere of Provence. Van Gogh left Paris in February and moved in his rented estate in Arles to try to establish an artist colony. The portrait in this painting is of an old Camargue peasant. His model's name is Escalier and in his life he works as a gardener in La Crau and later as a stockman. This painting is the 2nd version of Escalier. During this time Van Gogh was slowly moving away from Impressionism and moving toward Post-impressionism. In the painting "Portrait of Patience Escalier", the style is post-impressionism and mix with some aspects of impressionism. During this period Van Gogh had been experimenting with post-impressionism. He wanted to express his emotion through the use of colors. In Arles he discovered that color could be use to create emotion. His use of paint is in the style of impasto, where he applies thick application of paint. During this time period the art movement was impressionism with famous impressionist artist like Claude Monet and Camille Pisaaro. However Van Gogh wanted to express emotion in his painting, so he turned to post-impressionism." I was also happy to hear the original is in Pasadena, CA. That isn't too far to fly and see it. Anyone want to go? Skip Pasadena and go to Arles ... it was amazing seeing his residence and the actual area that he was painting. Go all the way to Amsterdam to the Van Gogh Museum! You'd love it!